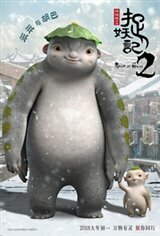 The story continues with Wuba after he parts way with his human parents Tian and Lan for his own journey. Peace has not been restored in the monster world after the death of the evil monster king as a sinister lord has ascended and seized the throne. A heavy bounty is placed on Wuba dead or alive, forcing him to go into hiding again. He encounters an ill-famed gambler Tu (Tony Leung Chiu-wai) who's deep in debt and seemingly up to no good. Together, they form a reluctant alliance in order to escape from their predicament.